Weighty Matters: Is obesity responsible for the recent rise in youth cancer? Is obesity responsible for the recent rise in youth cancer? Last week the Canadian Cancer Society released its report Canadian Cancer Statistics 2009. In it they report that between 1996 and 2005 the incidence of cancer among Canadian 15 to 29 year olds rose 0.8% per year in males and 1.4% per year in females. So the question of course is why? 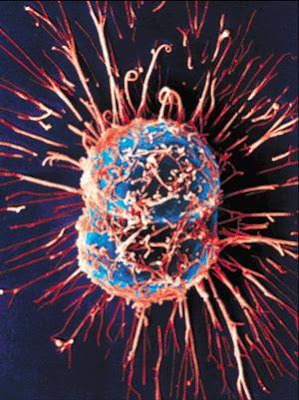 Why are cancer rates rising? While I don't want to jump on the bandwagon of blaming obesity for all of society's woes certainly given the established link between obesity and cancer in adults it doesn't seem a stretch to me to wonder if it's the rising weight of Canadian youth that's leading to this rapid rise in cancer. The Canadian Cancer Society may think weight's possible culprit too given that along with the obvious recommendations of "not smoking", "eating a healthy diet", "exercising" and "wear sunscreen", is "maintaining a healthy body weight". I imagine time will tell as data from surveys that include variables such as weight may help shed some light on this disturbing trend.